mdl = fscnca(X,Y) performs feature selection for classification using the predictors in X and responses in Y.
fscnca learns the feature weights by using a diagonal adaptation of neighborhood component analysis (NCA) with regularization. mdl = fscnca(X,Y,Name,Value) performs feature selection for classification with additional options specified by one or more name-value pair arguments. Generate toy data where the response variable depends on the 3rd, 9th, and 15th predictors. Fit the neighborhood component analysis model for classification. EXIT: Iteration or pass limit reached. 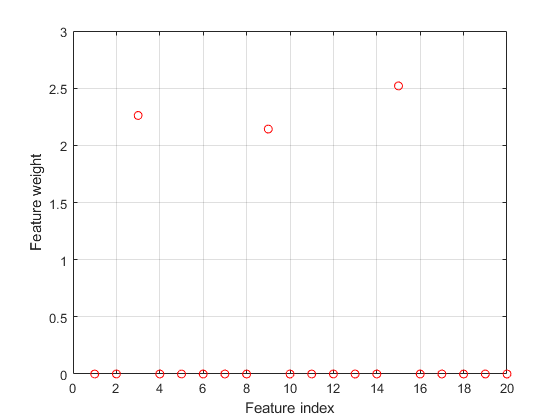 Plot the selected features. The weights of the irrelevant features should be close to zero. fscnca correctly detects the relevant features. This example uses the high-resolution ovarian cancer data set that was generated using the WCX2 protein array. The data is from the FDA-NCI Clinical Proteomics Program Databank. After some preprocessing steps, the data set has two variables: obs and grp. The obs variable consists 216 observations with 4000 features. Each element in grp defines the group to which the corresponding row of obs belongs. Use cvpartition to divide data into a training set of size 160 and a test set of size 56. Both the training set and the test set have roughly the same group proportions as in grp. Compute generalization error without fitting. This option computes the generalization error of the neighborhood component analysis (NCA) feature selection model using the initial feature weights (in this case the default feature weights) provided in fscnca. 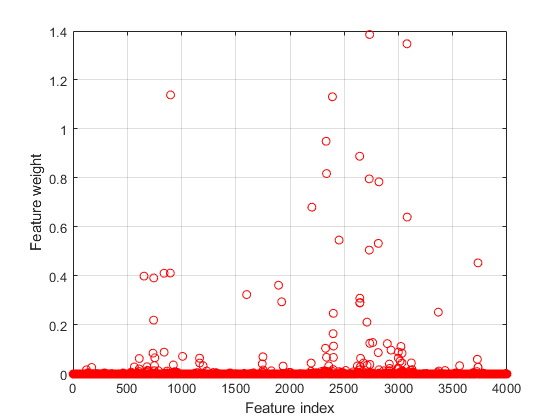 The improvement on the loss value suggests that feature selection is a good idea. Tuning the λ value usually improves the results. 1. Partition the training data into five folds and extract the number of validation (test) sets. For each fold, cvpartition assigns four-fifths of the data as a training set, and one-fifth of the data as a test set. Assign λ values and create an array to store the loss function values. 2. Train the NCA model for each λ value, using the training set in each fold. 3. Compute the classification loss for the corresponding test set in the fold using the NCA model. Record the loss value. 4. Repeat this process for all folds and all λ values. Compute the average loss obtained from the folds for each λ value. Plot the average loss values versus the λ values. 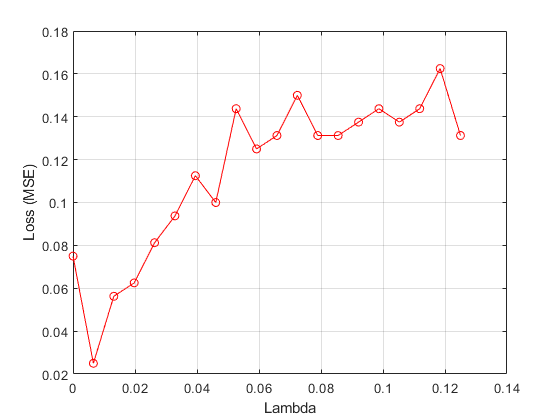 Find the best lambda value that corresponds to the minimum average loss. Use the solver lbfgs and standardize the predictor values. Select features using the feature weights and a relative threshold. Compute the classification loss using the test set. Extract the features with feature weights greater than 0 from the training data. 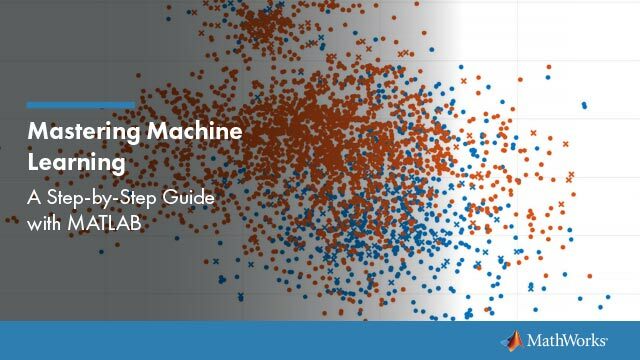 Apply a support vector machine classifier using the selected features to the reduced training set. Evaluate the accuracy of the trained classifier on the test data which has not been used for selecting features. Predictor variable values, specified as an n-by-p matrix, where n is the number of observations and p is the number of predictor variables. Class labels, specified as a categorical vector, logical vector, numeric vector, string array, cell array of character vectors of length n, or character matrix with n rows, where n is the number of observations. Element i or row i of Y is the class label corresponding to row i of X (observation i). Example: 'Solver','sgd','Weights',W,'Lambda',0.0003 specifies the solver as the stochastic gradient descent, the observation weights as the values in the vector W, and sets the regularization parameter at 0.0003. 'exact' — Performs fitting using all of the data. 'none' — No fitting. Use this option to evaluate the generalization error of the NCA model using the initial feature weights supplied in the call to fscnca. 'average' — Divides the data into partitions (subsets), fits each partition using the exact method, and returns the average of the feature weights. You can specify the number of partitions using the NumPartitions name-value pair argument. Number of partitions to split the data for using with 'FitMethod','average' option, specified as the comma-separated pair consisting of 'NumPartitions' and an integer value between 2 and n, where n is the number of observations. Regularization parameter to prevent overfitting, specified as the comma-separated pair consisting of 'Lambda' and a nonnegative scalar. As the number of observations n increases, the chance of overfitting decreases and the required amount of regularization also decreases. See Identify Relevant Features for Classification and Tune Regularization Parameter to Detect Features Using NCA for Classification to learn how to tune the regularization parameter. Width of the kernel, specified as the comma-separated pair consisting of 'LengthScale' and a positive real scalar. A length scale value of 1 is sensible when all predictors are on the same scale. If the predictors in X are of very different magnitudes, then consider standardizing the predictor values using 'Standardize',true and setting 'LengthScale',1. Initial feature weights, specified as the comma-separated pair consisting of 'InitialFeatureWeights' and a p-by-1 vector of real positive scalars, where p is the number of predictors in the training data. The regularized objective function for optimizing feature weights is nonconvex. As a result, using different initial feature weights can give different results. Setting all initial feature weights to 1 generally works well, but in some cases, random initialization using rand(p,1) can give better quality solutions. Observation weights, specified as the comma-separated pair consisting of 'ObservationWeights' and an n-by-1 vector of real positive scalars. Use observation weights to specify higher importance of some observations compared to others. The default weights assign equal importance to all observations. 'empirical' — fscnca obtains the prior class probabilities from class frequencies. 'uniform' — fscnca sets all class probabilities equal. ClassProbs — Vector of class probabilities. If these are numeric values with a total greater than 1, fsnca normalizes them to add up to 1. ClassNames — Class names corresponding to the class probabilities in ClassProbs. Indicator for standardizing the predictor data, specified as the comma-separated pair consisting of 'Standardize' and either false or true. For more information, see Impact of Standardization. When using 'minibatch-lbfgs' solver and verbosity level > 1, the convergence information includes iteration the log from intermediate mini-batch LBFGS fits. Default is 'lbfgs' for n ≤ 1000, and 'sgd' for n > 1000. Loss function, specified as the comma-separated pair consisting of 'LossFunction' and one of the following. @lossfun — Custom loss function handle. A loss function has this form. Yu is a u-by-1 vector and Yv is a v-by-1 vector. L is a u-by-v matrix of loss values such that L(i,j) is the loss value for Yu(i) and Yv(j). where w is the feature weight vector, n is the number of observations, and p is the number of predictor variables. pij is the probability that xj is the reference point for xi. For details, see NCA Feature Selection for Classification. Memory size, in MB, to use for objective function and gradient computation, specified as the comma-separated pair consisting of 'CacheSize' and an integer. Size of history buffer for Hessian approximation for the 'lbfgs' solver, specified as the comma-separated pair consisting of 'HessianHistorySize' and a positive integer. At each iteration the function uses the most recent HessianHistorySize iterations to build an approximation to the inverse Hessian. Initial step size for the 'lbfgs' solver, specified as the comma-separated pair consisting of 'InitialStepSize' and a positive real scalar. By default, the function determines the initial step size automatically. Maximum number of line search iterations, specified as the comma-separated pair consisting of 'MaxLineSearchIterations' and a positive integer. Relative convergence tolerance on the gradient norm for solver lbfgs, specified as the comma-separated pair consisting of 'GradientTolerance' and a positive real scalar. Initial learning rate for the 'sgd' solver, specified as the comma-separated pair consisting of 'InitialLearningRate' and a positive real scalar. When using solver type 'sgd', the learning rate decays over iterations starting with the value specified for 'InitialLearningRate'. The default 'auto' means that the initial learning rate is determined using experiments on small subsets of data. Use the NumTuningIterations name-value pair argument to specify the number of iterations for automatically tuning the initial learning rate. Use the TuningSubsetSize name-value pair argument to specify the number of observations to use for automatically tuning the initial learning rate. For solver type 'minibatch-lbfgs', you can set 'InitialLearningRate' to a very high value. In this case, the function applies LBFGS to each mini-batch separately with initial feature weights from the previous mini-batch. To make sure the chosen initial learning rate decreases the objective value with each iteration, plot the Iteration versus the Objective values saved in the mdl.FitInfo property. Number of observations to use in each batch for the 'sgd' solver, specified as the comma-separated pair consisting of 'MiniBatchSize' and a positive integer from 1 to n.
Maximum number of passes through all n observations for solver 'sgd', specified as the comma-separated pair consisting of 'PassLimit' and a positive integer. Each pass through all of the data is called an epoch. Frequency of batches for displaying convergence summary for the 'sgd' solver , specified as the comma-separated pair consisting of 'NumPrint' and a positive integer. This argument applies when the 'Verbose' value is greater than 0. NumPrint mini-batches are processed for each line of the convergence summary that is displayed on the command line. Number of tuning iterations for the 'sgd' solver, specified as the comma-separated pair consisting of 'NumTuningIterations' and a positive integer. This option is valid only for 'InitialLearningRate','auto'. Number of observations to use for tuning the initial learning rate, specified as the comma-separated pair consisting of 'TuningSubsetSize' and a positive integer value from 1 to n. This option is valid only for 'InitialLearningRate','auto'. Maximum number of iterations, specified as the comma-separated pair consisting of 'IterationLimit' and a positive integer. The default is 10000 for SGD and 1000 for LBFGS and mini-batch LBFGS. Each pass through a batch is an iteration. Each pass through all of the data is an epoch. If the data is divided into k mini-batches, then every epoch is equivalent to k iterations. Convergence tolerance on the step size, specified as the comma-separated pair consisting of 'StepTolerance' and a positive real scalar. The 'lbfgs' solver uses an absolute step tolerance, and the 'sgd' solver uses a relative step tolerance. Maximum number of iterations per mini-batch LBFGS step, specified as the comma-separated pair consisting of 'MiniBatchLBFGSIterations' and a positive integer. Mini-batch LBFGS algorithm is a combination of SGD and LBFGS methods. Therefore, all of the name-value pair arguments that apply to SGD and LBFGS solvers also apply to the mini-batch LBFGS algorithm. Neighborhood component analysis model for classification, returned as a FeatureSelectionNCAClassification object.